Find your own ski in and out by owner rental in Monarch-click on this link! Want to do a by owner search for yourself? 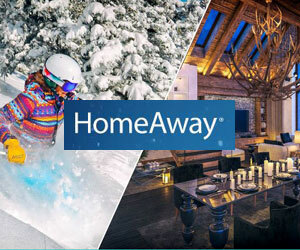 Check VRBO/Homeaway! Do a petfriendly search! Ski Town Condos- 2 bedroom, 1 bath, Slps 4- from $150/nt - Book it! 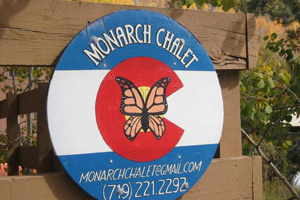 Trip Advisor Listing #FKN3949575-Escape to Monarch, Colorado! Make yourself at home -Ski Town Condos feels plenty rustic with all the modern amenities you could ever need. Snooze in a charming log bed, soak in the bubbles of the hot tub, upload pictures from your daily adventures using your access to wireless internet. 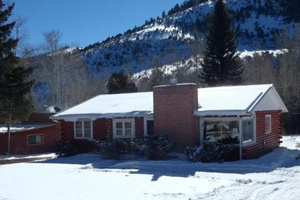 Ski Town Condos Vacation Rental is an inviting alternative to hotel lodging at Salida hotels while enjoying more for your money in a cozy & friendly vacation rental! Featuring 2 bedrooms, 1 bath, fully equipped kitchen, washer/dryer, & a hot tub outside in the gazebo! Sleeps 6 guests maximum with 1 queen, 1 double, & built-in bunk bed in the hallway. Additional $15 + 6.8% tax for the 5th & 6th person. Rates are based on 4 guests. 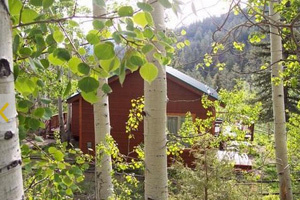 High Country Getaway- 2 bedroom, 2 bath, slps 6, from $200/nt-- Book it! Monarch Chalet -3 bed, 2 bath, slps 10, from $250/nt - Book it! Trip Advisor Listing #FKN2380011- Built in the 1970's by a local ski legend, this house is full of character. 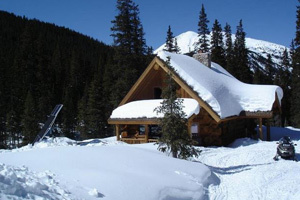 It's located in the sleepy town of Monarch, just ten minutes from Monarch Ski Area and amazing natural powder! Monarch, along with the chalet, are perfect for families. Fun extras include a hidden dart board, surround sound and an indoor sauna. There is plenty of firewood for the wood-burning stove to keep you warm. The house is constantly being updated - last year we replaced the flooring, this year it was the downstairs shower and most of the bedding/linens. Spruce Ridge Guest Cabin -1 bed, 2 bath, slps 5 - from $139/nt- Book it! Trip Advisor Listing #FKN3915927-Tucked away in tall pines and aspens and overlooking the Little Cochetopa Creek, our modern 1,000 sq. ft. fully furnished vacation home is located 10 miles west of Salida, Colorado and 20 minutes from Monarch Ski Resort. Private, secluded, scenic and easily accessible on a county maintained road the cabin sleeps up to four people and includes one bedroom with queen sized pillowtop bed with high thread count sheets and a sleeper sofa, two bathrooms, a full kitchen, living room with pellet stove, a queen sized sleeper sofa, and TV for DVD movies, utility room with W/D, a mudroom for extra storage and three outside decks. Kitchen includes full-sized cooking microwave, full sized stove/oven, dishwasher, small appliances, pots and pans, dinnerware. Bathrooms include hairdryers, soap, shampoo and body conditioner and luxurious Egyptian cotton towels. 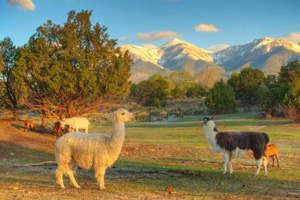 Available year-round it is situated on our 35 acre llama ranch at 8,450 feet, surrounded by the San Isabel National Forest. Monarch Gem --3 bed, 1 bath, slps 6, from $185/nt- Book it! Trip Advisor Listing #FKN5613945-Newly remodeled 1200 sq. ft, 3 bedroom, 1 bath log home, on a quiet lane, nestled among tall aspen and spruce trees, backing up to a mountain stream, with views of The Continental Divide Alpine Range from the large, front windows. Roll back to the 50's - knotty pine, original rounded refrigerator and stove, retro chairs and table, Leave it to Beaver fixtures, BUT wireless internet, down comforters, gas fireplace. There's actually a Beaver Creature hanging above the fireplace. Thank you, Bungled Jungle. River City Chalet --3 bed, 2 bath, slps 10, from $350/nt- Book it! Trip Advisor Listing #FKN5586753-Adventure abounds at this amazing RIVER FRONT home in historic downtown Salida, Colorado. 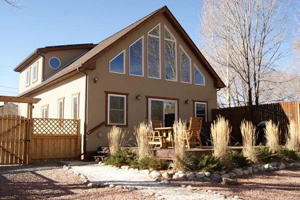 River City Chalet is a premier Salida vacation rental that is only 5 doors down from the Salida Boat Launch. It's an ideal location for strolling the streets of historic downtown Salida, tubing the Arkansas River right from the spectacular back yard and for watching the world famous FIBArk Festival. This open concept, custom house has 3 bedrooms (1 king bed, 1 queen bed, 2 twin beds), a loft futon, 2 rollaway beds, 2 bathrooms (downstairs: shower/tub combo - upstairs: shower) and sleeps 8-10. 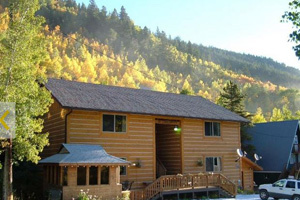 Mountain Goat Lodge Goat Farm--10 beds, 11 baths, slps 28, from $1200/nt- Book it! Trip Advisor Listing #FKN2381724-The Mountain Goat Lodge is a B&B located just outside of beautiful Salida, CO. Each of the 6 bedrooms has a private bath, queen or king bed, balcony and mountain view. We also have 4 additional trailers sleep 3 persons each for total of 28 people (trailers available only during June - Sep for 130.00 per night). We have 19 acres that your group may enjoy - hiking, communing with the animals, sipping coffee during the winter inside our warm and inviting geodesic dome greenhouse. During milking season, the owners are around to give barn tours and milking demonstrations. The goats are super friendly and enjoy being petted. Free range chickens wander around for local color. The great room has cozy fireplace with leather sofas, easy chairs, and grand piano. We are pet friendly. 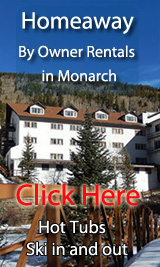 Monarch By Owner Rentals- Our Blog!